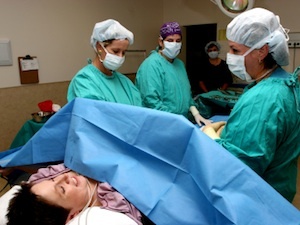 There has been a tradition in hospitals to keep the placenta after birth so that some of the nutrients that were lost could be returned to the mother later if necessary. There are also some medical uses for the placenta that have shown that it can reduce the severity of conditions related to birth such as postpartum depression. More recent research has started to show that there is also medical value in saving cord blood after birth so that it can potentially be used by the family to treat a variety of problems in the future. Cord blood is blood that is extracted from the inside of the umbilical cord within minutes after birth. The blood can be extracted from both the fetal and placental end of the cord in order to acquire the most cells possible. The blood contains progenitor stem cells that have the capacity to grow into platelets, red blood cells and white blood cells. Saving cord blood cryogenically in a banking facility can help to preserve these cells so that they can be used by the newborn child if needed, or to allow the stem cells to be infused into another matching member of the family for treatment. One large advantage is that cord blood comes from a known genetic source. The hematopoietic stem cells that are stored are a perfect genetic match for the newborn child. This means that the cells can be used in a variety of medical procedures without the risk for rejection. The same cells can very often be used to treat the parents of the newborn as well as other immediate family members. Properly banked cord blood can be kept in a well equipped facility for decades or longer if necessary. Cord blood is used primarily for stem cell transplants. This can be used to treat a number of diseases. Some forms of cancer such as leukemia and lymphoma can be treated with a transplant. It is also possible to treat several immune disorders as well as some diseases that affect the blood like sickle cell. Stem cells from cord blood are much more desirable in transplant medicine than other sources such as bone marrow because there is a lower chance of rejection and fewer types of possible infections. Regenerative medicine is often mentioned in other FAQs as a quickly growing area that requires stem cells from cord blood. Research is revealing that these cells can be used to grow or repair tissue in the body that might have been damaged by a heart attack or stroke. These types of regenerative treatments are not ready for human use yet. Banking cord blood after birth can help to preserve the cells until a future date where regenerative procedures could be used to help treat an illness in the family.